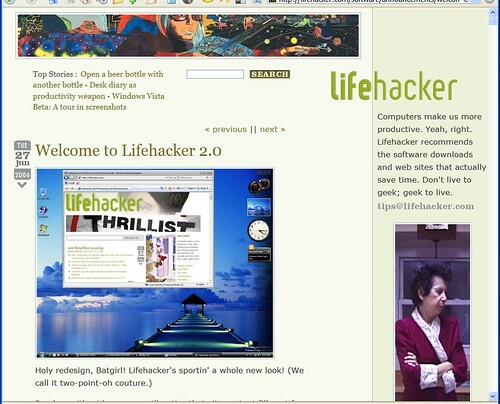 Lifehacker's new look came out today. In general, I like the changes, however, the left sidebar was too much for me. Thankfully there's Greasemonkey... If you like using it, please leave a comment. You can install the script here, just be aware that this comes with no warranties of any type, so use at your own risk. You should be using Firefox and have the Greasemonkey extension installed. (If you don't, you can easily find them with Google.) Version 0.32 fixes some late-night bugs (disappearing LifeHacker) and makes some minor improvemens. Turns out that late night hacking introduced a version control problem. This script is licensed under a Creative Commons Attribution-NonCommercial-ShareAlike 2.5 License.